The set of five images above are a sequence related to the word balance, in visual language we had to use a set of 10x10 squares and the letter A to effectively visually communicate a verb. A group member would then guess the word you worked with by what they see. This sequence was guessed correctly. 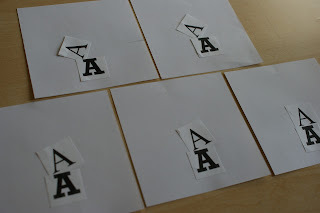 This sequence is portraying the word pop, although it was guessed incorrectly, a group member thought it was slip, which is understandable as it looks like the letter A is slipping apart. 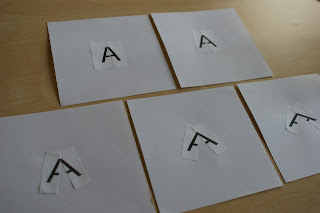 I think if i had opened it from the top it may have been clearer, but as your popped the letter out more it began to look like a H.
The exerise has been very useful and helps you to understand layout, frame and format in order to communicate visually in an effective way.